The horse was injured in the Australian race on 3 November, but it had been hoped he would recover, until complications set in. Owner Ron Arculli said the popular nine-year-old gelding's final resting place would be at Flemington Racecourse where he was second in the Melbourne Cup three times. Trainer Ed Dunlop added: "Red Cadeaux has given us and the racing public so much joy competing with great distinction across the world. He was an incredibly tough competitor with a wonderful nature and he will be dearly missed by all. 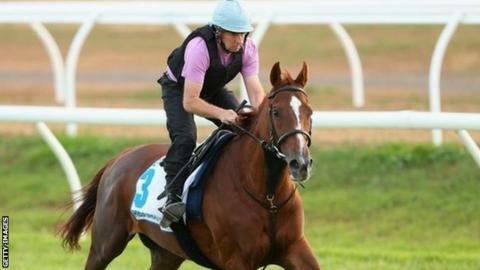 Red Cadeaux was euthanised on Friday after blood stopped flowing to the foot on his injured left foreleg. Red Cadeaux was runner-up in the Melbourne Cup in 2011, 2013 and 2014. He was only beaten a nose by Dunaden in 2011. Second in the Dubai World Cup, won by Animal Kingdom.